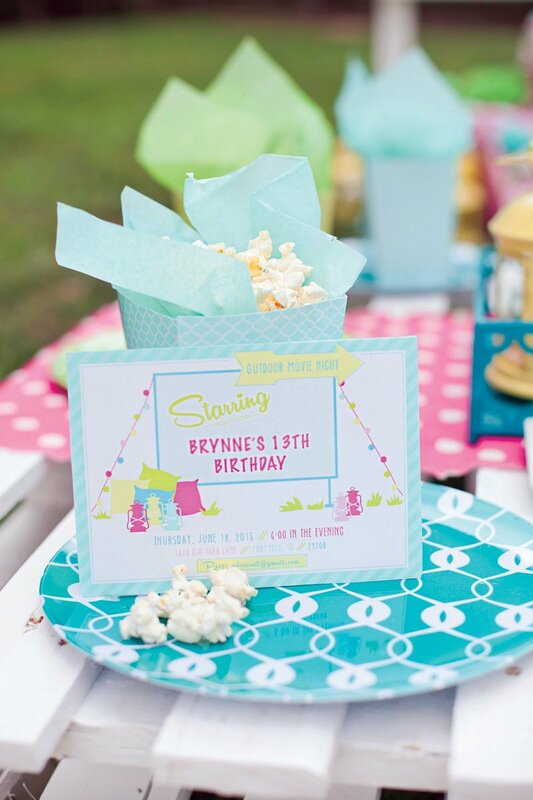 We are so excited to share with you Brynne’s 13th Birthday Outdoor Movie Night featuring a Jelly Belly Concession Stand, decorated movie screen, outdoor seating with monogrammed pillows and blankets and a festive popcorn bar. 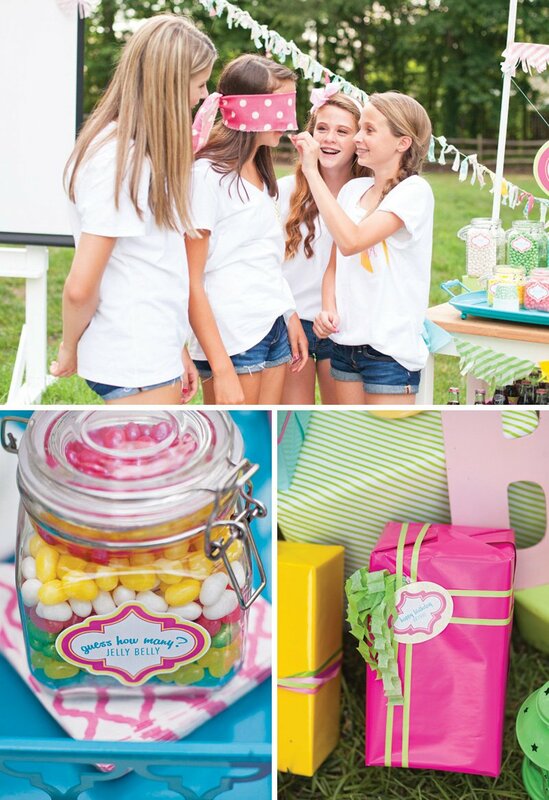 We had the privilege of partnering with Jelly Belly to create the perfect jelly bean display for Brynne’s movie birthday party. 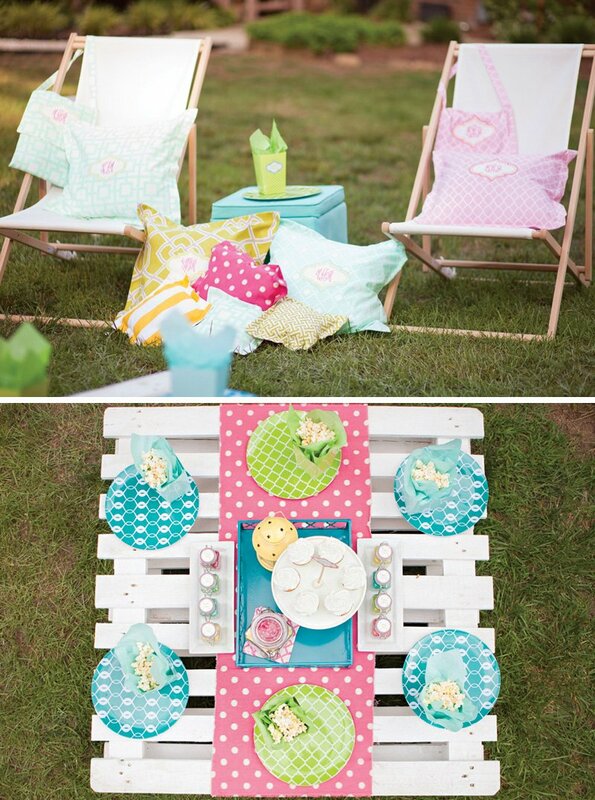 We also partnered with Ikea Charlotte Store who helped us create a modern outdoor setting (tables, chairs, lanterns and paper party supplies) for these teen girls. Brenda from Great Stitch provided the adorable monogrammed shirts, pillows & blanket totes. We used bright white furniture such as outside lounge chairs, a drafting table, kitchen cart and a DIY pallet coffee table to give a clean look. 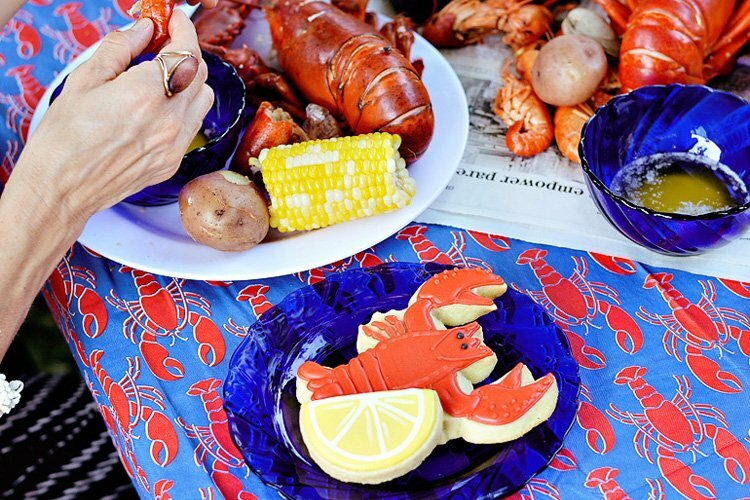 We accented each piece with vibrant colors and modern patterns in fabrics and tissue paper garlands to create a bold contrast to the white furniture. 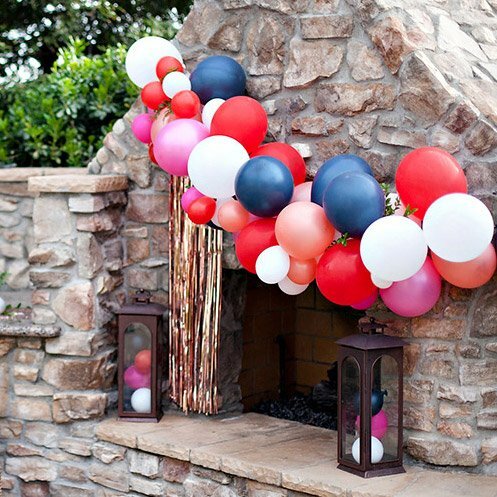 It was a perfect mix of old an new for a fun and trendy teen party. 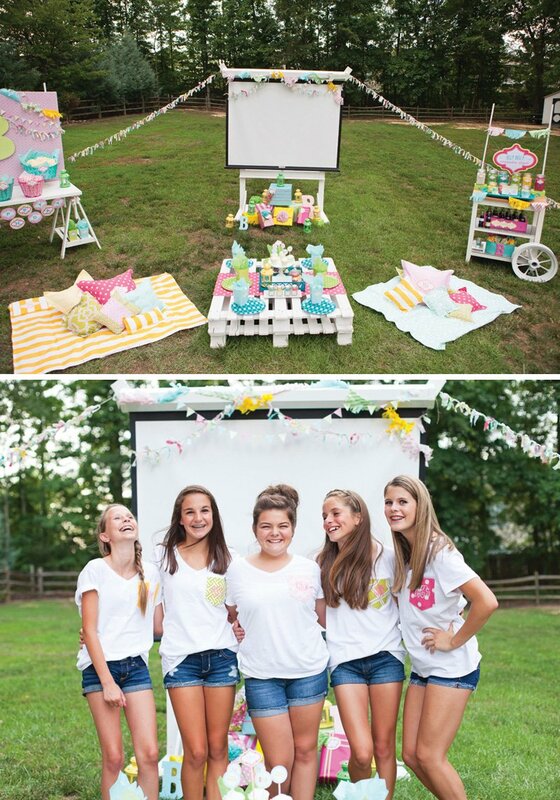 Brynne’s guests joined us for this outdoor movie night party and started off by getting dressed in their monogrammed t-shirts made by Great Stitch. 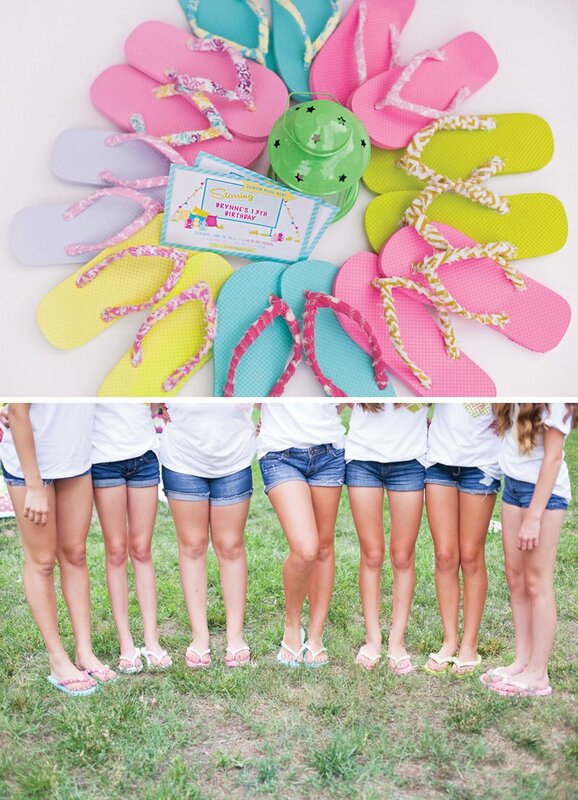 Then they chose coordinating DIY fabric flip-flops that we had created for them. Once they were finished, the girls went outside to start the Jelly Belly Decorating Contest with cupcakes. The girls used Jelly Belly candy in blues, greens, pinks, yellows and whites to decorate their cupcakes. 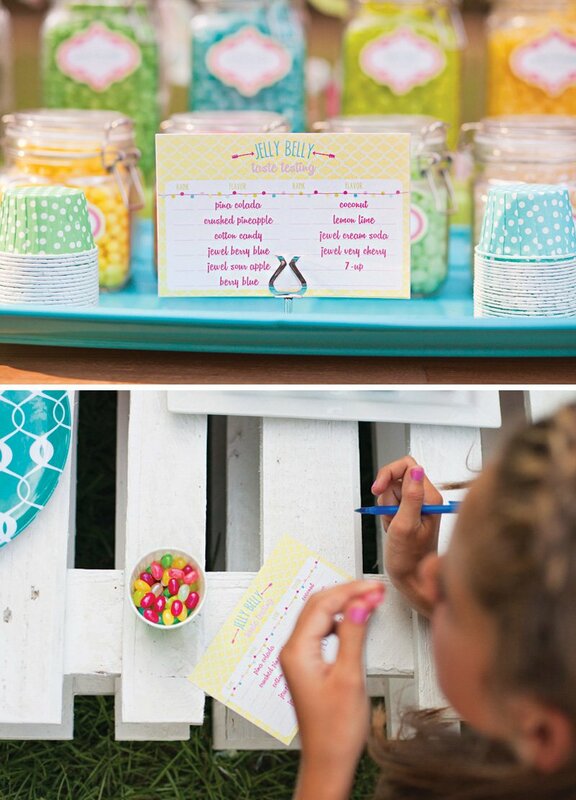 We put the jelly beans in small jars by color for them to use. 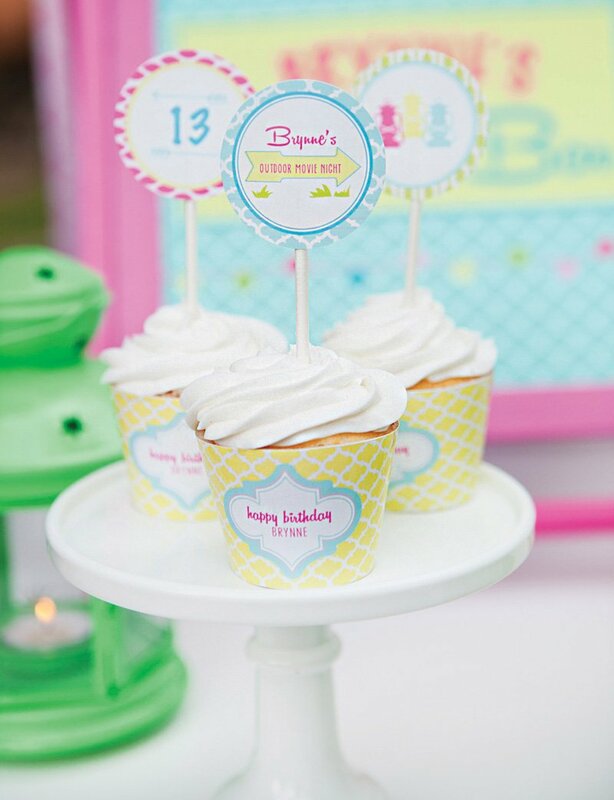 We used our printable labels to decorate each jar along with a “Decorate your Cupcake” printable sign. 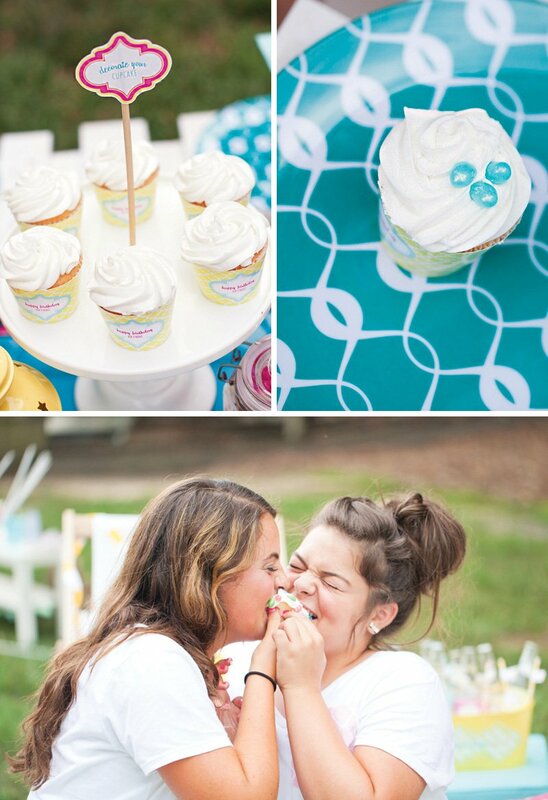 Once they finished enjoying their Jelly Belly decorated cupcakes, they moved onto a Jelly Belly Taste Test. 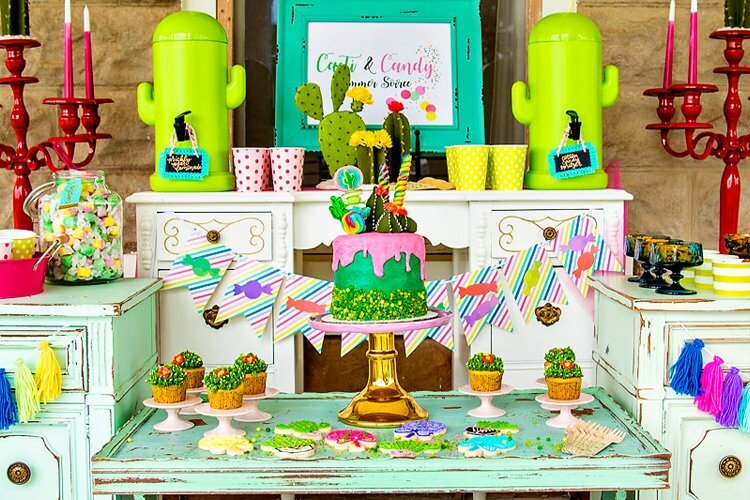 We created a candy cart by transforming an Ikea Kitchen Cart by placing a vintage wagon wheel in front and a printable party sign hanging above. We also created fringe semi-circle garland with tissue paper and wrapped colorful gifts in wrapping paper from Ikea’s party shop. 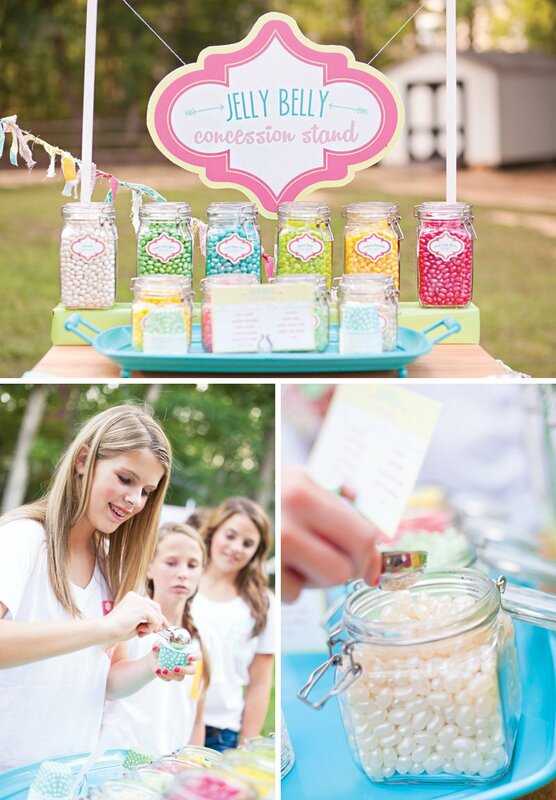 We stacked jars with several flavors and colors on two tiers in two jar sizes so all the Jelly Belly Jelly Beans were able to be seen. 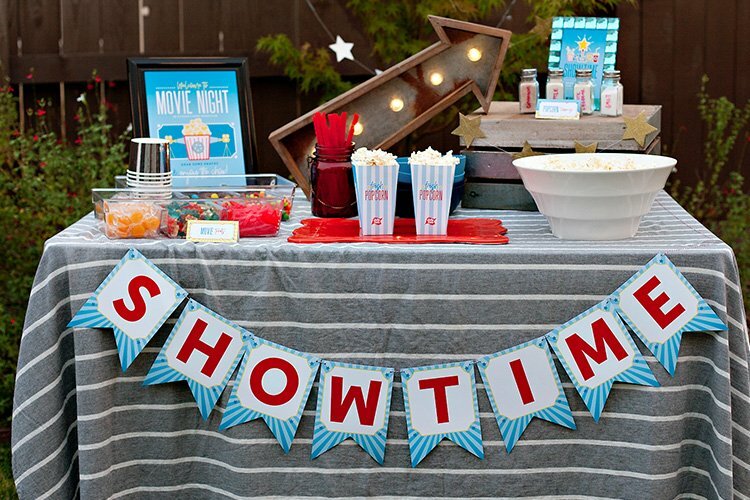 We indicated each flavor with printable party labels from our Outdoor Movie Night full printable package. We also placed our soda pop bottles in a vintage pop container on the second shelf along with paper plates, napkins and utensil party supplies. We had the girls get in line and sample all the Jelly Belly Jelly Beans in sampler cups. They then tried each flavor and rated from 1-11, one being the best and 11 being the worst. They loved testing all the flavors and comparing notes with each other. They took this task quite serious but had so much fun along the way. After Brynne and her friends rated the Jelly Belly Jelly Beans, they did a blind taste test as well. The girls each took turns feeding jelly beans to each other, along with guessing the flavors. After gorging on jelly beans and cupcakes it was time for a salty snack from the Popcorn Bar. We sat out a variety of popcorns such as buttered, white cheddar, chocolate and caramel popcorn. 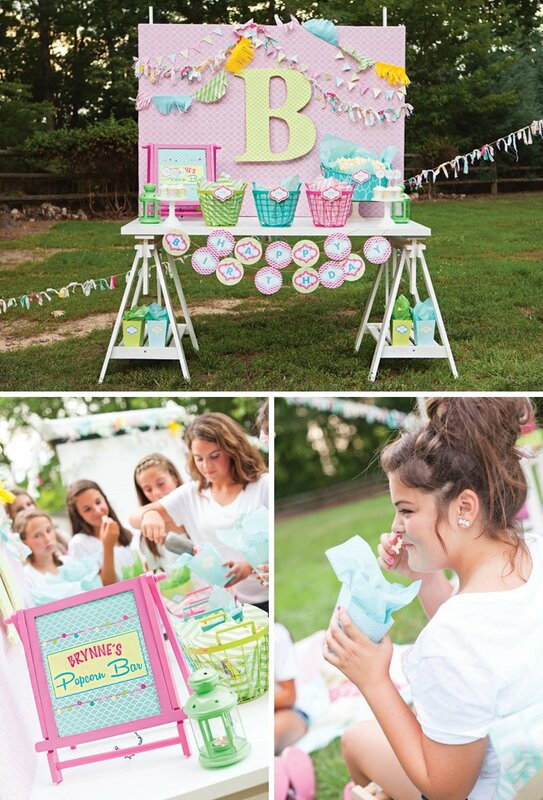 We displayed a printable popcorn sign with an oversized fabric monogram “B” and various garlands on a backdrop for a colorful setting. 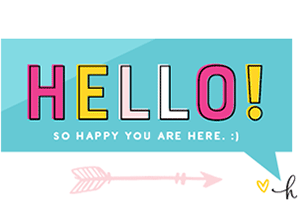 We added a printable happy birthday banner and lanterns for a final touch. And of course the girls needed a refreshing soda to go along with their popcorn snacks. 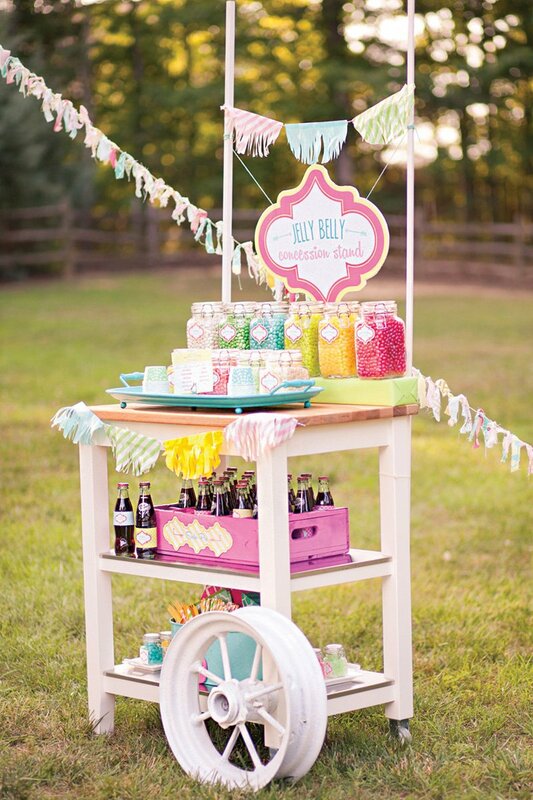 We offered mini soda pops in a vintage soda pop crate and also sparkling waters in a modern day drink container. 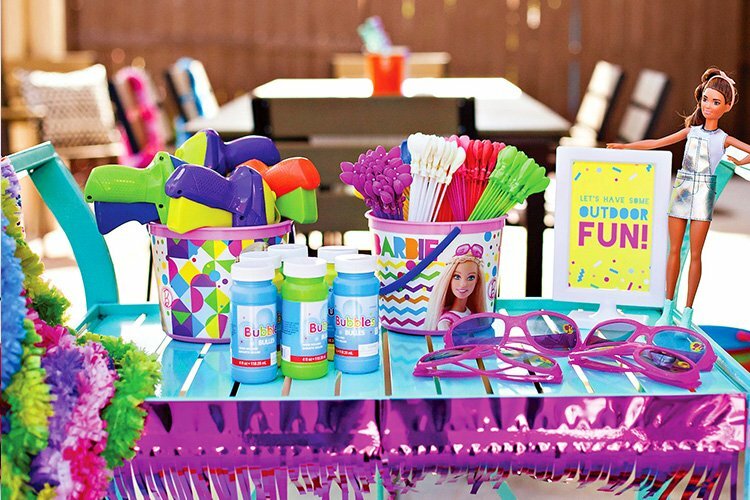 There were several options to choose from and we embellished them with printable drink wraps, straws and printable party flags. The girls played one more game before they started the movie… They played the classic game of guess how many candies are in the jar, using Jelly Belly Jelly Beans. In case you are wondering, I did count them all and the total in the jar was 689. The winner took them home!!! 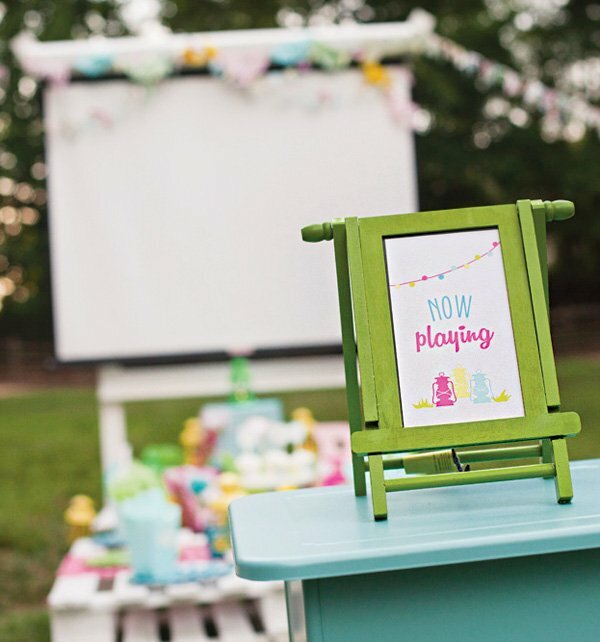 Last but not least… movie time! 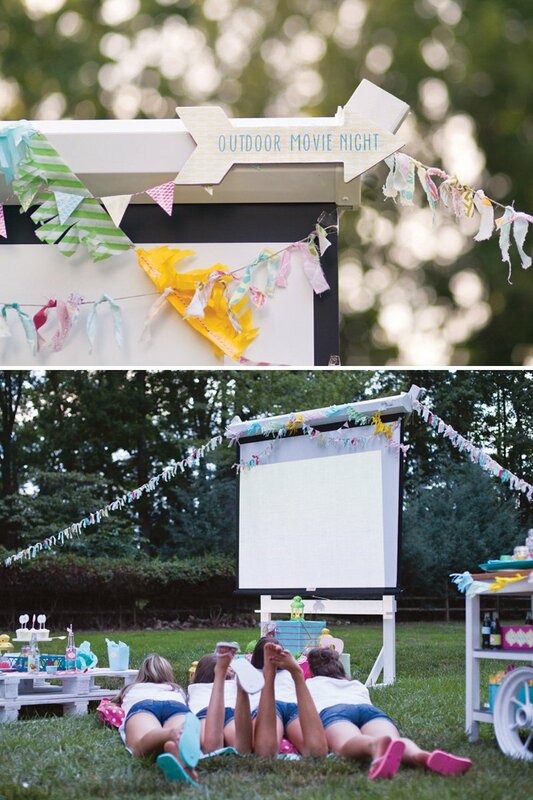 Make sure you check out our Outdoor Movie Night Printable Collection so you can recreate this party this summer! Any idea where I can find that invitation to order? where is the movie screen from? I am interested in how the backdrop was created with the big letter B? 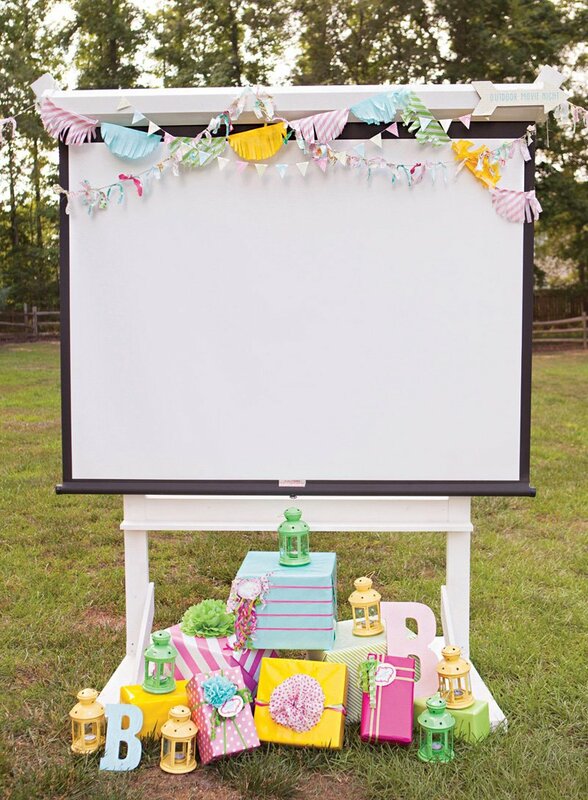 Can you give any information on the outdoor projector? I don’t know anything about them.